Steve Gillmor: "If John Lennon were alive today, he might be releasing direct to Net via RSS enclosures." Packet Storm Security is offering three RSS feeds. Jager for Windows supports RSS 2.0 enclosures and HTTP and XML-level redirection. According to John Palfrey, Gator, the adware scorge of Internet users worldwide, is going public. Some professional reporters mean well, but still can't get the story right. I spent an hour on the phone with the reporter, I didn't say the things she says I said. It's totally mangled. Oy. RSS 2.0 is extensible, and it's totally clear now that Atom is no more "open" than RSS is. Highly recommended, the PBS biography of Ronald Reagan. 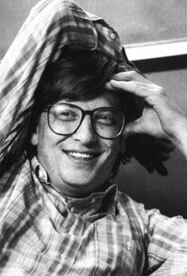 Audio for 1/2 of the Bill Gates keynote at ADAPSO in 1991. I'm on this tape proposing that Apple and Microsoft work together on interapplication communication, which is the pre-Internet precursor to XML-RPC and SOAP. I talked much faster 13 years ago. There's another tape out there somewhere, where Gates says okay, he'll work with Apple, but I don't seem to have it. The rest of the story is here. Tim Berners-Lee: "There would have been a CERN Web, a Microsoft one, there would have been a Digital one, Apple's HyperCard would have started reaching out Internet roots." The Guardian: "It is always necessary to declare an interest when the journalist is writing about something with which he or she has a significant connection. This applies to both staff journalists and freelances writing for the Guardian. The declaration should be to a head of department or editor during preparation. Full transparency may mean that the declaration should appear in the paper or website as well." I'm looking for info on some really strange hubcaps. Gizmodo on Nokia's new phones. I wonder if Russ changes his advice on the next cell phone this newbie should get. Two years ago today I stopped smoking. Today I occasionally want a cigarette, but much less than I did a year ago, and that's much much less than two years ago. On that day: "It's going to be a light day here on Scripting News. Lots of non-Internet stuff going on." Indeed. Shortly after writing that, I stopped at a Woodside gas station and got two packs of Marlboro Lights. Rolled down the window and lit one. Drove to the cardiologist's office. I was having severe chest pain. Weakness. Difficulty breathing. A feeling of doom. When I got to the office they wanted to put me on a treadmill, but I refused, I felt too frail. They did an EKG. Nothing wrong. Then an ultrasound. Also normal. The doctor sat me down and said there's probably nothing wrong with my heart, but let's do an angiogram just to be sure. We walked over to Sequoia Hospital, luckily it was downhill. I undressed, signed papers. They explained that if they found a blockage they could fix they'd put in a stent. I said I hoped that's was what it was. They wheeled me into surgery, put me half-under. I was sort of conscious through the operation, but have almost no memory of it. I woke up in a private room, with no idea what had happened. A couple of hours later the cardiologist came in. I was still in a daze. He was yelling. I got the impression I was very sick. Didn't know what was happening. Later somehow I learned that I had four blocked arteries feeding my heart and that they'd do bypass surgery on Monday. I cried and cried. And learned a lot. Maybe I'll write some more about it. On the Sunday before my surgery, I said to Tori -- "You know I haven't decided to stop smoking yet." Then after the surgery, not sure which day it was (probably Tuesday morning) in the ICU, the surgeon comes to see me, really sharply dressed, with a sharply dressed woman with him (not sure who she was). The doctor says "You're a computer guy, right?" I said I was. "What's the word you guys use for seeing something?" I asked if he meant visualize. "That's it!" he exclaimed. "Now I want you to visualize yourself as a smoker." Since I had been trained in meditation, I thought I was about to be deprogrammed. Okay, I'm visualizing. "You're dead!" he said and started laughing. What do you mean? I asked. "People like you who keep smoking are usually dead within three years," he explained. Gulp. Somehow, in all the doom and gloom it had never really sunk in that I had almost died. If I had waited another couple of weeks to deal with this, well, I don't even like to think about it. Anyway, that was the moment. That was when I decided to stop smoking. Last update: Monday, June 14, 2004 at 9:43 PM Eastern.